Daniel 10:13 . . . but the prince of the kingdom of Persia stood in my way for twenty-one days, until finally Michael, one of the chief princes, came to help me . . . .
Daniel 11: 1 . . . . “No one supports me against all these except Michael, your prince, standing as reinforcement and a bulwark for me. Daniel 12: 1 . . . . the Angel speaking of the end of the world and the Antichrist says: “At that time there shall arise Michael, the great prince, guardian of your people; it shall be a time unsurpassed in distress since nations began until that time. At that time your people shall escape, everyone who is found written in the book. Apocalypse 12: 7. And there was a battle in heaven; Michael and his angels battled with the dragon, and the dragon fought and his angels. 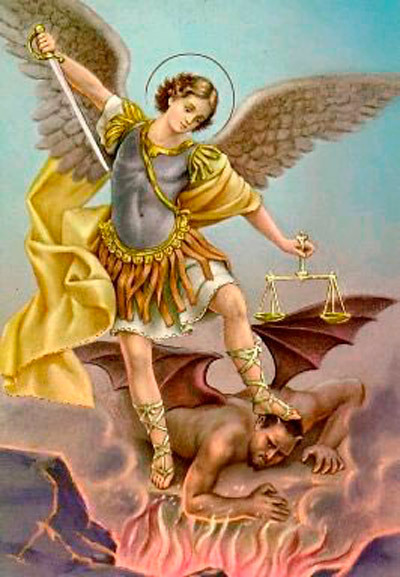 Following these Scriptural passages, Christian tradition gives to St. Michael four offices: 1) to fight against Satan; 2) to rescue the souls of faithful from the power of the enemy, especially at the hour of death; 3) to be the champion of God’s people, the Jews in the Old Law, the Christians in the New Testament; therefore he was the patron of the Church and of the orders of knights during the Middle Ages; 4) to call away from earth and bring men’s souls to judgment. 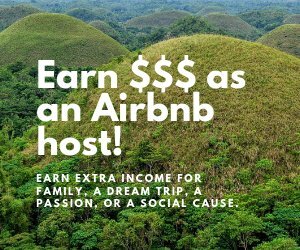 Regarding his rank in the celestial hierarchy opinions vary; St. Basil (Hom. 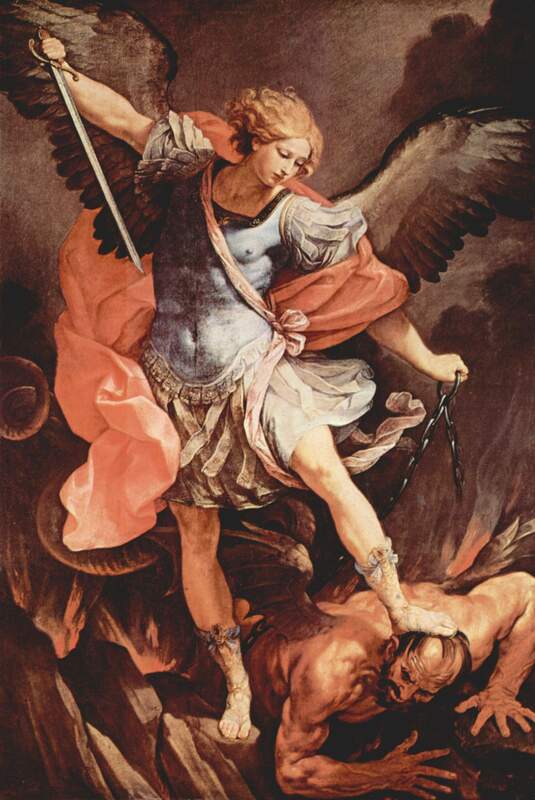 de angelis) and other Greek Fathers, also Salmeron, Bellarmine, etc., place St. Michael over all the angels; they say he is called "archangel" because he is the prince of the other angels; others (cf. P. Bonaventura, op. cit.) believe that he is the prince of the seraphim, the first of the nine angelic orders. But, according to St. Thomas (Summa Ia.113.3) he is the prince of the last and lowest choir, the angels. The Roman Liturgy seems to follow the Greek Fathers; it calls him "Princeps militiae coelestis quem honorificant angelorum cives". The hymn of the Mozarabic Breviary places St. Michael even above the Twenty-four Elders. The Greek Liturgy styles him Archistrategos, "highest general" (cf. Menaea, 8 Nov. and 6 Sept.). 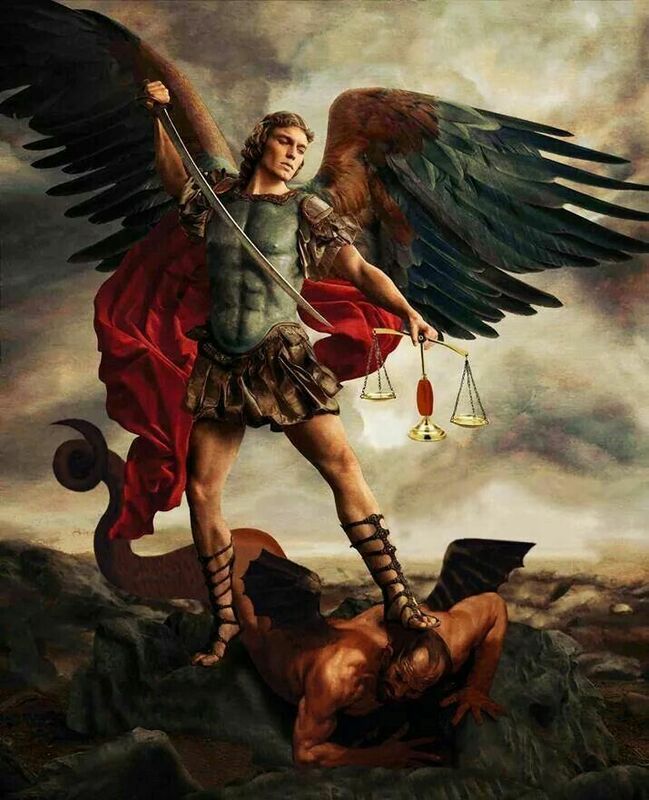 It would have been natural to St. Michael, the champion of the Jewish people, to be the champion also of Christians, giving victory in war to his clients. Yet the early Christians instead regarded some of the martyrs as their military patrons: St. George, St. Theodore, St. Demetrius, St. Sergius, St. Procopius, St. Mercurius, etc. ; to Saint Michael they gave the care of their sick. In Phrygia, the place where he was first venerated, he was known more as the angelic healer rather than a military intercessor. Tradition relates that St. Michael in the earliest ages caused a medicinal spring to spout at Chairotopa near Colossae, where all the sick who bathed there, invoking the Blessed Trinity and St. Michael, were cured. 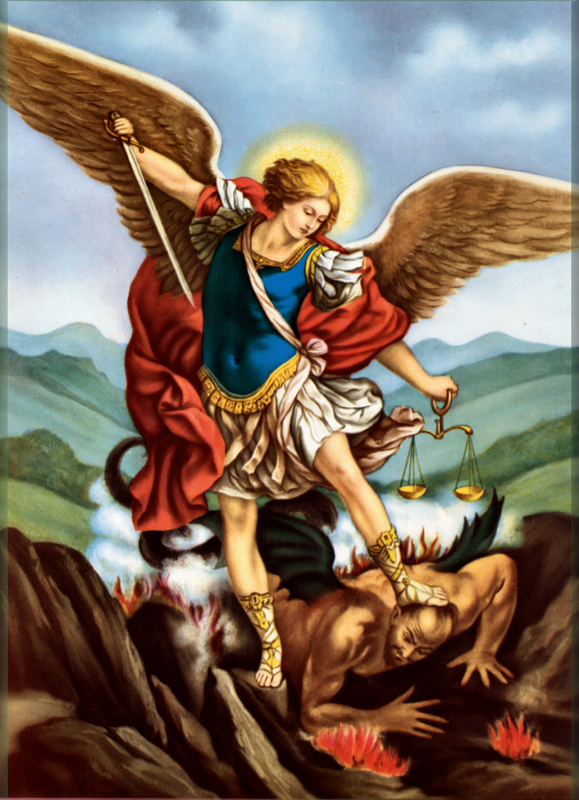 Also, St. Michael is said to have drawn from the rock the springs at Colossae. The pagans directed a stream against the sanctuary of St. Michael to destroy it, but the Archangel split the rock by lightning to give a new bed to the stream, and sanctified the waters which came from the gorge. The Greeks claimed that this took place about the middle of the 1st century and celebrates a feast in commemoration of it on September 6. Also in Pythia in Bithynia and elsewhere in Asia, the hot springs were dedicated to St. Michael. Michaelion at Sosthenion (about fifty miles south of Constantinople) is his principal sanctuary where he is considered as the great heavenly physician. He is said to have appeared here to Emperor Constantine. At this church, the sick waits for a manifestation of St. Michael and his feast day falls on June 9. Within the walls of the city, at the thermal baths of the Emperor Arcadius, another famous church honors him and celebrates his feast day on November 8 and this practice spread over the entire Greek Church. It was adopted also in the Syrian, Armenian, and Coptic Churches in Phrygia. Other churches at Constantinople celebrate his feast: October 27 in the “Promotu” Church, June 18 in the Church of St. Julian at the Forum, and December 10 at Athaea. The Christians of Egypt placed their life-giving river, the Nile, under the protection of St. Michael; they adopted the Greek feast and kept it 12 November; on the twelfth of every month they celebrate a special commemoration of the archangel, but 12 June, when the river commences to rise, they keep as a holiday of obligation the feast of St. Michael "for the rising of the Nile”. At Rome in the year 950, he was said to appear over the Moles Hadriani (Castel di S. Angelo) during the procession which St. Gregory held against the pestilence, putting an end to the plague. In his honor, a church was built on the Moles Hadriani by Boniface IV (608-15). Another well known apparition site is at Monte Gargano. 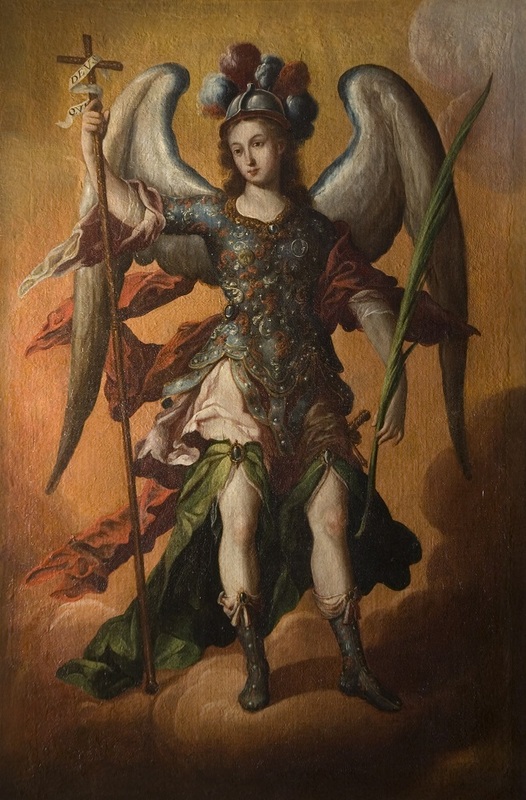 Here, St. Michael’s original glory as patron in war was restored to him. The Lombards of Sipontum (Manfredonia) attributed their victory to him over the Greek Neapolitans on May 8, 663. A special feast in his honor was instituted on this day by the Church of Sipontum and this practice spread over the entire Latin Church. In Normandy, St. Michael is the patron of mariners in his famous sanctuary at Mont-Saint-Michel in the Diocese of Coutances. He is said to have appeared there, in 708, to St. Aubert, Bishop of Avranches. The feast is celebrated on Oct. 18 and is now confined to the Diocese of Coutances. In Germany, after its evangelization, St. Michael replaced for the Christians the pagan god Wotan, to whom many mountains were sacred; hence the numerous mountain chapels of St. Michael all over Germany. The hymns of the Roman Office are said to have been composed by St. Rabanus Maurus of Fulda (d. 856). In art St. Michael is represented as an angelic warrior, fully armed with helmet, sword, and shield (often the shield bears the Latin inscription: Quis ut Deus), standing over the dragon, whom he sometimes pierces with a lance. He is also depicted holding a pair of scales in which he weighs the souls of the departed, or the book of life, to show that he takes part in the judgment. His feast on September 29, in the middle Ages, was celebrated as a holy day of obligation, but along with several other feasts it was gradually abolished since the eighteenth century. St. Michael is much loved in the Philippines. He is venerated in Iligan, an industrial city situated in the island of Mindanao and part of the Lanao del Norte province. Likewise, the Boholanos are not behind in their devotion to the Archangel Michael. He is much loved, especially by the Jagnaanons. They celebrate his feast day every 29th of September and they do this with much fanfare. New Testament of Our Lord and Saviour Jesus Christ, Translated from the Latin Vulgate.